Previous post: What would you do if you could do anything? I’ve decided that if I’m serious about designing my own jacquard patterns, I really must learn to draw. So, in my typical happy style, I’ve signed up for not one, not two, but three classes in drawing. The first is Drawing Foundations, a class in drawing with traditional media (i.e. pencil and paper), at Pacific Art League. The second is Jane Dunnewold’s online class in composition, which begins right after Drawing Foundations ends. And the third is the most exciting one – a class called Digital Painting at Cogswell Polytechnical College. (That one is still uncertain, though – it depends on whether my boss will let me take the time off, as it’s only offered during the day. I’ll know more next week.) It starts in late May and ends in late July – just before the loom arrives. Hooray! I’m not entirely certain whether I can handle two concurrent classes in drawing along with a full-time job and finishing the book, but I figure I’ll give it a try. I can always drop one or more of them if it turns out to be too much work. 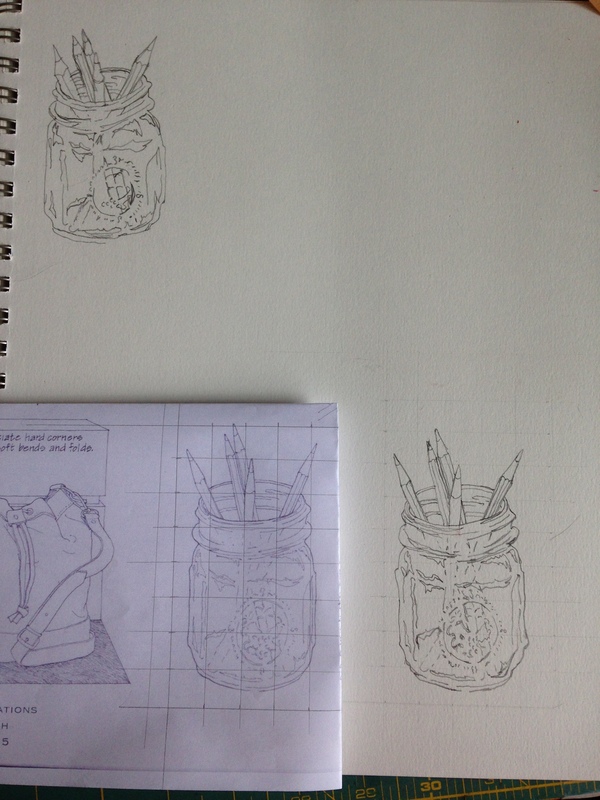 The exercise was to copy a drawing of a jar, first freehand (top left) and then using a grid (bottom right). You can see how much more accurate the drawing done with a grid is. Our next assignment is to take a photograph that tells a story. I think we’re going to spend a couple of weeks analyzing and then drawing a copy of the photo, to get practice in rendering and shading. I’ve been thinking about the assignment for several days now – unfortunately, the objects I own are almost exclusively craft tools, so I didn’t think they made for exciting stories. But then I decided to approach it from the other direction. I wanted a photo that I liked enough to spend a month drawing. So what kind of photo would I like? Well, that was a no-brainer. I wanted to draw a photo related to weaving. 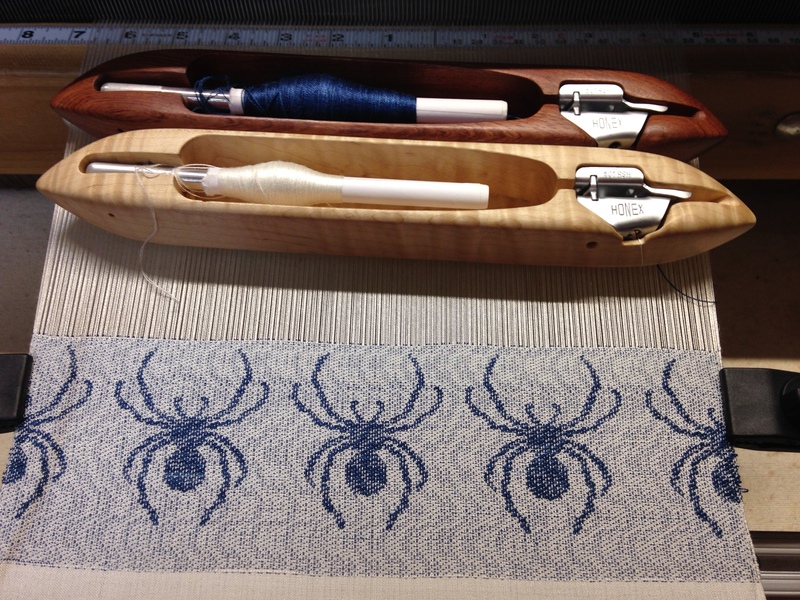 In fact, I wanted to draw some cloth on the loom, with a shuttle in the background. So what would fit with that story? The first thing I thought of was the legend of Penelope and Odysseus: Penelope weaving and unweaving Laertes’s (Odysseus’s father) burial shroud as a way to fend off her unwelcome suitors. But that would be way too complicated a concept to get across in a single photo. I’ll likely use a smaller shuttle for my photo, as these feel a bit too large – wish I had some miniature ones! A tiny damask shuttle would be just the thing. But I have some small Swedish shuttles from Bluster Bay that might fit the bill, leaving space to include a tiny spindle. I’m really excited about drawing this photo- I think it will be a lot of fun. Congrats on getting your pieces into the show! I’ll be very interested to see how that works out. Your work is beautiful! Love the spider motif! You are super-talented at all you do! I know you’ll absorb lots from the drawing classes and become even more skilled. I see you have a white centering tape on your beater bar…can you tell me where you found it? I’ve been looking for one and only have found a yellow one! I bought the measuring tape on Amazon (it’s actually two measuring tapes, one right to left and one left to right). Try searching for “L to R” or “R to L” measuring tape; that should get you lots of options.